Fans of my wife's pottery--rejoice! 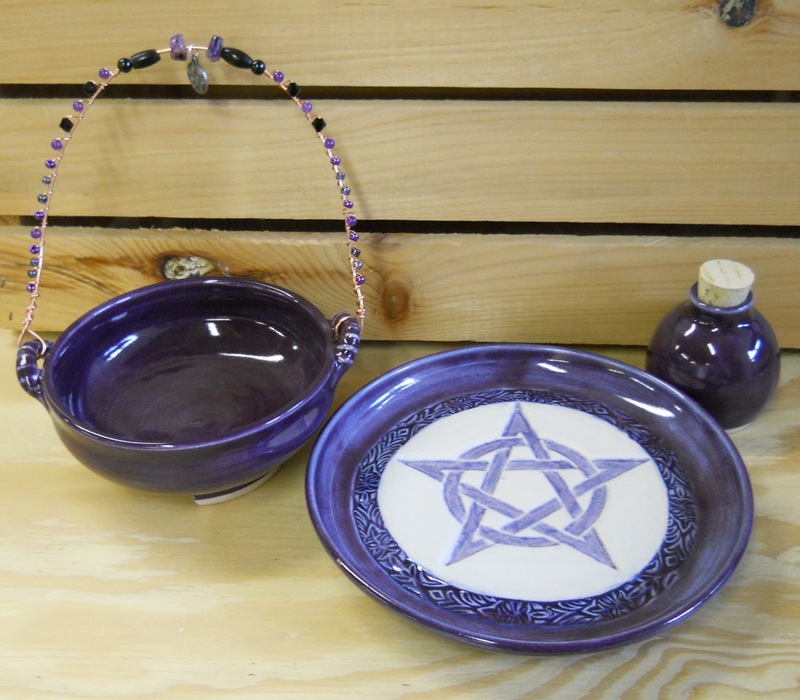 My wife has finally opened the door for you to order a custom made Altar set which includes a chalice, an offering bowl (plate), a cork jar (for herbs or aromatherapy), and an incense burner cauldron with a beaded copper handle and charm. By special ordering the complete set, you can have all the components match in color and style. Colors available are white, black, cobalt blue, green, brown and purple. You can special-order a custom made altar set over in her NEW Wiccan, pagan, magickal themed Etsy shop, Khari's Wiccan Treasures. 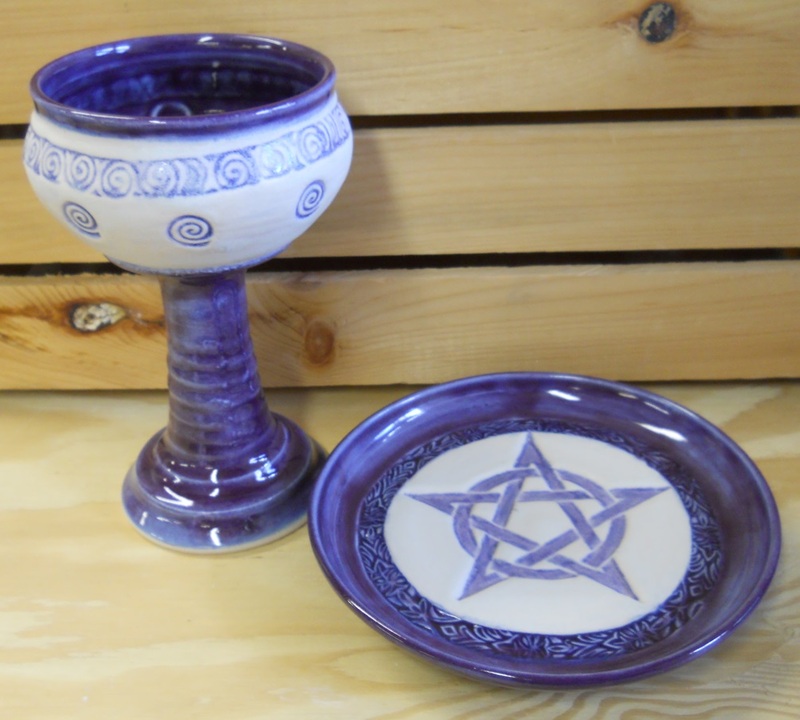 Chalice and offering bowl--pansy purple. And honestly, for years, I have been telling her that she has been leaving money on the table by not having a wider selection of "magickal" styled goods on Etsy. But I also understoond her reluctance to the idea. After all, I keep some of my writing under a completely different pen-name, so not to upset some of the people who would frown on the fact that I used to write erotica. 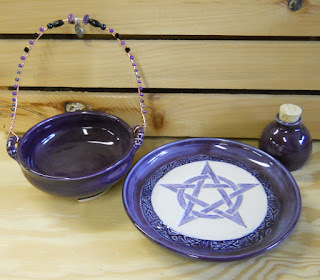 Cauldron, offering plate (bowl), and corked herb jar--pansy purple. Her new Etsy shop is called Khari's Wiccan Treasures. 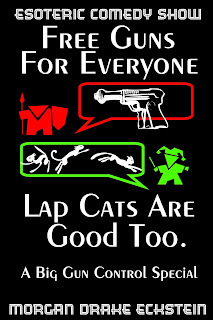 I have also set up a Facebook fanpage for the new shop.